Land hermit crabs are completely adapted to life on land, living under leaf litter or in other sheltered areas. A common error made by people is completely submerging these crabs in water, mistaking them for marine animals. Unfortunately hermit crabs can only survive for a few minutes when completely submerged. They are not true crabs because they do not have their own shell. Instead they use shells from dead gastropods in order to protect their soft abdomens. They are a long lived species - sometimes reaching the age of 40 years and older - so they go through a lot of shells! Hermit crabs start their lives moving through a variety of larval stages whilst floating in the ocean. The larvae spend the first 40 - 60 days of their life alongside plankton until they change into a hermit crab/lobster shape. 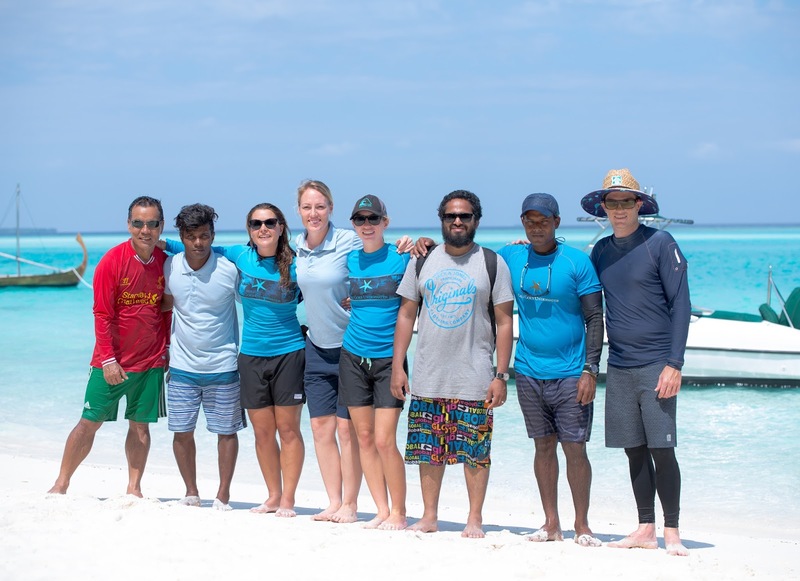 In this final larval stage they find a small shell and over the period of a month will spend more time on land until they finally molt and leave the ocean for good. 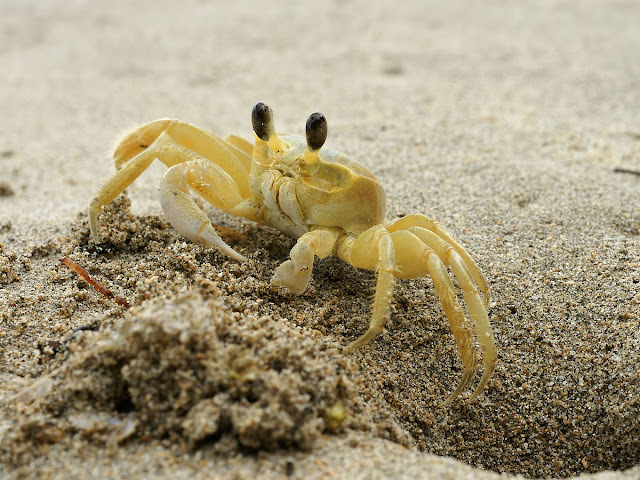 By feeding on vegetation, insects, detritus, other smaller hermit crabs and microbes in the sand the crab grows in size. To accommodate this growth their hard exoskeleton must be shed periodically during the year and this process will carry on through-out the hermit crab’s life. As they grow in size the hermit crab molts less frequently and the molt process takes longer, during which time the crab will stay completely submerged in the sand. Young crabs and female crabs create burrows with sand scattered everywhere, with young crabs preferring to create burrows nearer to the water, whilst male crabs have burrows with a neat mound of sand outside - the larger the crab the larger the mound. Males produce mating sounds, squeaking noises, in a variety of ways; by rubbing their right claw on their leg, by rubbing their legs together, or by using their gill chambers, which they keep moist with saltwater. Fiddler crabs are a small and short lived species of crab (up to two years) and are closely related to ghost crabs. They are found in mangroves, brackish water, mud flats, lagoons and swamps. The colouration of the crabs change in correlation with circadian rhythm - during the day they are dark and at night they are light. Fiddler crabs are well known for their sexual dimorphism - the male’s major claw is much larger than the females. If the large claw has been lost the male will develop a new large claw on the opposite side, which will appear after molting. The female’s claws are the same size. 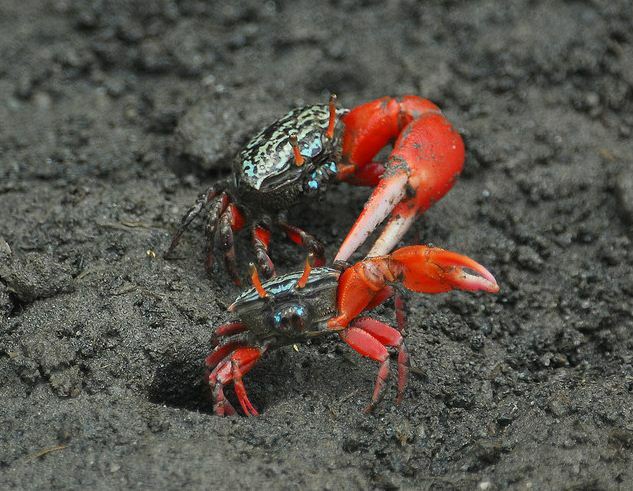 The crabs use their claws in communication, courtship and combat. The male claw is used in waving displays which signals to the female that they are ready to mate. A more vigorous waving display indicates a healthier male and a larger claw indicates a wider burrow which will provide better temperatures for egg incubation. Females chose their partners based on claw size and the quality of waving. Once a female has been attracted she will reside in the male’s burrow whilst the eggs are being laid. The female will carry her eggs on the underside of her body for a two week gestation period. After this period the female will venture out of the burrow and release the larvae into a receding tide. During feeding the crabs move their smaller claw from the ground to their mouth. This movement looks like the crab is playing the smaller claw like a fiddle – hence the name, fiddler crab. The smaller claw is used to pick up the sediment which is then sifted through in the crab’s mouth. Algae, microbes and fungus are the preferred diet of the crab. After the nutrients are extracted the sediment is placed back onto the ground in a ball. The feeding habits may play a vital role in preserving the ecosystem as they aerate the soil. The fiddler crab can be seen when visiting local islands, especially in the mangrove area at low tide.